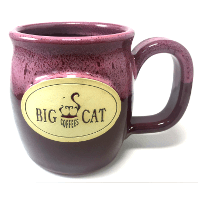 “Holds enough coffee to make sure you don’t blink for a week!” This solid beauty is a best seller and once you lift this mug, you’ll know why. Skillfully handcrafted in Wisconsin — 16 ounces; 4.25"h. Dishwasher, microwave and oven safe. 100% lead-free. FDA and California Proposition 65 compliant. Ounces may vary. Due to the nature of handmade processes, styles and glazes will vary in consistency resulting in unique appearances. Razzmatazz is a two-tone glaze based in sweet and tart mulberry blush topped with berry-colored razzle-dazzle!